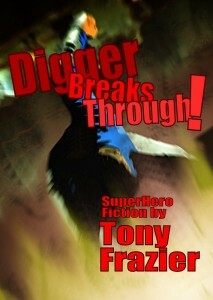 Digger is a superhero whose adventures I’ve been writing since 2006. Here’s what’s been published so far and where. The good news is that you don’t have to go hunting around for all the stories now. Digger Breaks Through! is an anthology that collects all the published Diggerverse stories in one volume, along with three previously unpublished stories. It’s available for only $2.99 at Smashwords or on Amazon for the Kindle. Or if you prefer print to pixels, you can buy a paperback version from my Createspace store for $7.95 here.